Copland's Hoedown, and some Grappelli. 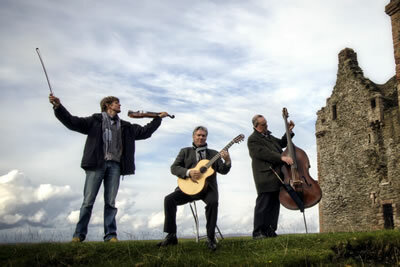 The Tim Kliphuis Trio are one of the world’s top string groups, combining jaw-dropping virtuosity and mesmerizing improvisations with a beautifully varied repertoire sourced from classical music, Grappelli’s gypsy jazz and folk. 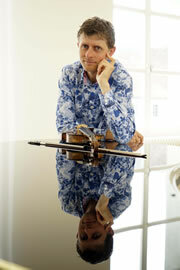 Dutch violinist Tim Kliphuis is joined by his long-standing colleagues Nigel Clark (guitar) and Roy Percy (double bass). The Trio’s electrifying performances and remarkable audience rapport have made them firm favourites on the festival scene. Highlights include the Amsterdam Concertgebouw, collaborations with the Netherlands Chamber Orchestra, Richard Strauss Festival and Baltimore Fiddle Festival. In 2013, they received the Scottish Jazz International award. Numerous videos on YouTube available here. Dutchman Tim Kliphuis (violin) breathes new life into existing styles with a high-energy blend of classical, gypsy jazz and folk music. His improvised sound is totally new and has popular appeal. Classically trained and widely regarded as Stéphane Grappelli’s heir, Kliphuis first made his name playing with the fiery European gypsy guitarists, then developed a more personal style which has taken him on a busy touring schedule around the world. The Richard Strauss in Bavaria Festival was the first to commission Tim’s trademark improvisations on classical music, which now include Vivaldi, Vaughan Williams, Richard Strauss, Britten and many others. Tim has shared the stage with legends Frankie Gavin, Richard Galliano and Les Paul and has been lauded for his musical genius by Nigel Kennedy. He is still in touch with the traditional Sinti gypsies through regular performances with The Rosenberg Trio. An in-demand educator, Kliphuis is the author of best-selling book Stéphane Grappelli Gypsy Jazz Violin, the much praised Hot Jazz Violin DVDs and Jazz Etudes on video. His workshops have been featured at festivals, conservatoires and summer courses in the USA, Canada, UK, South Africa, Switzerland, Japan and throughout Europe. Tim holds the jazz violin chair at Tilburg Conservatoire and hosts an annual sell-out Gypsy Jazz Grappelli Camp back home in the Netherlands every August. Nigel Clark (guitar) has worked with some of the biggest names in jazz and pop throughout the last 15 years and has toured the world as a leader, sideman and accompanist. After stints with folk and jazz groups as a student, Nigel joined the charting Scottish band Hue & Cry in 1987, and became their arranger and guitarist for the next four years. Nigel’s visibility in the pop world led to high profile collaborations with Maire Brennan (the singer with Clannad), Scottish singer‐songwriter Carol Laula and American legend Gloria Gaynor. After switching to the nylon-strung guitar, Nigel formed his own acoustic group Worldwide Sound, which climbed to No. 4 on the UK charts. Since then, he has shared the stage with a host of jazz stars including Carla Bley, Steve Swallow, guitarists Jan Akkerman and Philip Catherine. A lasting musical connection was formed with legendary Scottish vocalist Carol Kidd, including many albums and extensive tours of the Far East. Nigel also was a driving force behind the Scottish Guitar Quartet, and has recently released his first solo album Under the Stars. His continuing tours and recordings with Tim Kliphuis reinforce his love of Django Reinhardt and give him the improvisational canvas his style demands. 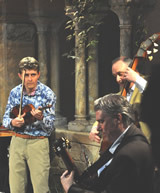 Roy Percy (double bass) has been a driving force in many bands since the 1980s. Starting out in the New Orleans tradition, he soon added swing, big band and Jump-Jive to his repertoire, leading to collaborations with UK jazz names Forrie Cairns, Alan Barnes and David Newton. As well as touring UK and European Festivals, Roy has been a frequent transatlantic visitor, appearing at the Sacramento Jazz Jubilee, LA’s Sweet and Hot Festival and Canada’s Victoria Jazz Festival. Nearer home, he has worked with many visiting international jazz musicians at the Edinburgh Jazz Festival including Duke Heitger, Evan Christopher, Bob Barnard and Marty Grosz. Roy brings raw street rhythms and infectious grooves from New Orleans to the Trio’s style. His unique bass slapping techniques, unrivalled in Europe, and his subtle dynamic feel make for a great range of emotions.